GP-2000 Goop-Proof™ RF Point Level Switch - HiTECH Technologies, Inc.
HiTECH’s low-cost, GP-2000 GOOP-PROOF™ radio frequency (RF) point level switch, designated the Model GP-2000, operates on a wide range of liquids, slurries and solid materials. Its Goop-Proof circuit design allows the GP-2000 to Ignore goopy build-up of any type on the sensing probe. Operating on the RF Impedance sensing principle, HiTECH’s GP-2000 will detect the presence (high level) or absence (low level) of virtually any material in any type of bin or tank. It may be made Fail-Safe In either high or low mode. The GP-2000 will operate In conjunction with process materials which range from low dielectric products such as refined oils to conductive slurries. 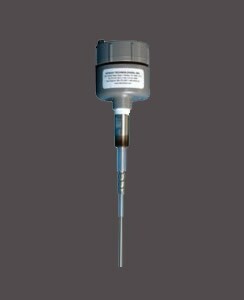 The GP-2000 is used in conjunction with a HiTECH GOOP-PROOF™ sensing probe. They are typically constructed from Teflon and 316 Stainless Steel and can function with high temperatures and pressures as well as being compatible with corrosive process materials. ELECTRONIC HOUSING: Heavy-duty Cast Aluminum Explosion-proof Housing Class 1, Division 1, Group D; Class II, Groups E, F, & G.